This weekend, we send you along a historical trail deep in the Upper Missouri River Breaks National Monument. Directions: From Missoula, head east on Interstate 90 to Bonner and then depart the freeway onto Highway 200 all the way through Lincoln and on to Great Falls via Highway 89. Continue east of Great Falls on Highway 87 to Lewistown, and then turn north onto Highway 191, crossing the Fred Robinson Bridge to the D-Y Junction. There you’ll turn left onto Route 66 and continue another 13 miles, turning right onto the Pine Ridge Road. What to expect: The rugged badlands at Cow Creek, in the heart of the Missouri Breaks, is rich with history – the place where steamboats stopped to unload cattle, where the Nez Perce crossed the Missouri following a skirmish with U.S. troops, and another stop along the way for the Lewis and Clark Expedition to the Pacific. It’s also the site of several historic homesteads, including the BLM-renovated Gilmore Cabin, one of the stops along the way on this particular hike. If you have 4-wheel drive, start your trek near the Spencer Cow Camp on Cow Creek. If you park on Spencer Ridge before the road begins to drop off, you’ll just hike down the road for about two miles to the Spencer cabins, past the corrals and to the ATV trail to the west. After a couple of washouts, the trail heads sharply up the bluffs. Continue about a mile until you reach the two-track road; there you’ll see a windsock for a backcountry airstrip to the left. Keep going straight past the airstrip, and after another half-mile of gradual gain you’ll be on Bullwhacker Road. Turn left and follow this road a mile and a half to the Gilmore Cabin. From there, turn left off Bullwhacker Road and head east. A bit of incline will bring you to the highest elevation – about 3,200 feet. 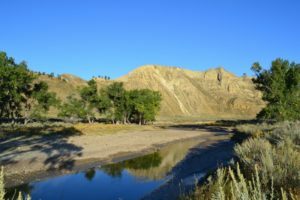 As the road winds down the ridge, you will have stunning views of the Cow Creek drainage from north to south, the Little Rockies to the northwest, and the Judith Mountains across the Missouri River to the south. The Bears Paws loom in the distance to the north. The road starts to drop into Cow Creek and peters out into washouts. After three miles, you will cross Cow Creek and turn left (north). This marks the eastern boundary of the Cow Creek Wilderness Study Area. Also look for the log cabin ruins of what was the Werk Post Office during the homesteader days. You are now on the Nez Perce Trail, and will soon pass a skirmish site. The exact location is uncertain. This is also a section of the Cow Island Trail where bullwhackers freighted goods unloaded from steamboats at Cow Island. Now only a cow trail exists, and meanders through tall sagebrush for three miles back to the Spencer place. From here, it’s either hike back up the steep grade, or to your 4-wheel drive.